Kotor is unforgettable. He attracts thousands of tourists by its beauty. So what is special in it? Listen, I will tell you. Kotor is Cultural Centre of the Kotor Bay. There is a Stari Grad (Old Town) in it. I want to say a few words about Stari Grad. I have visited the top of it, i.e. fortress, so I can say that as from any high viewing platform from there opens up a beautiful view. But you should climb there not only for the sake of amazing view but also to for the purpose of proving to yourself that you are able to do this. Every day huge liners from different countries come to Kotor, disembark tourists for a walk around the Stari Grad. So don’t be surprised if thousands of tourists walk the narrow streets of Stari Grad. Let’s continue our trip. Prcanj is a small town in 4 km from Kotor. It has a sight – Tre Sorelle (Three Sisters). Legend of the Three Sisters. Not far from Kotor, in the village of Prcanj, there is a palace with three windows on the very cost, two of which are bricked up. Legend says that three sisters lived in this palace — Nera, Bianca and Rose. It is assumed that they had come from a noble Kotor family of Bucha. The sisters were known for their beauty and goodness in the entire Boka. But, their trouble was that they all liked the same guy — Erko Novlyanin. Erko, fickle nature sailor from Herceg-Novi, could not decide which of the sisters he loved more than the others and decided to go on a sea voyage on his ship and to think up everything well. A sister who will wait for his return would become his wife. As the years passed, the sisters were sitting in their palace, in their rooms, at their windows, looking at the sea and expecting the return of a loved one. Passed youth, they all waited and waited. When the oldest sister died, the remaining two bricked her window. Then the second sister died, without seeing her sailor — the third sister in tears bricked her window too. When the youngest Rose died, she had no one to brick up her window, so it remained open. And there is still preserved palace with two bricked-up windows in Prcanj. Even nowadays, residents name this palace «Tre sorelle» (Three Sisters). Also, Prcanj has Temple of the Theotokos. In this small and cosy town, there are two grocery stores and a bakery with fresh, fragrant baking. Perast is an old town in Montenegro. 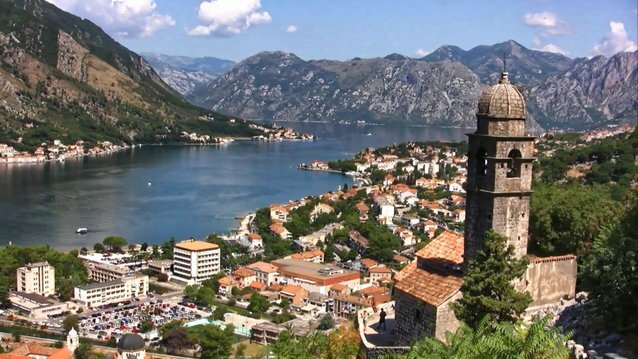 It is located on the shore of the Kotor Bay on the Adriatic Sea. The length o its coastline is only 320 meters. Having swept a water taxi past St. George Island, you get to a small island called Gospa od Skrpela, but hurry to sail there before a big launch with tourist come. During my journey, I lived in Prcaj (which had been described earlier). Up to mount Lovchen it was about 60 km. Calling a taxi, we reached the top in about 70 minutes. At the top is quite windy, so I advise to take a jacket, even if at the foot you were hot just in a t-shirt. 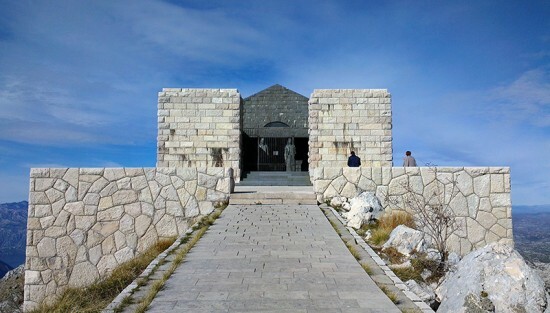 At the top of the mountain is a mausoleum – the tomb of the last spiritual ruler of Montenegro, Prince-Bishop Petar II Petrovic Nyoshov. Walking a couple of steps from the parking lot( where is often too much transport) you can get to the café-restaurant and souvenir shop. In the mausoleum, you need to buy a ticket that costs about 4 euros per person. There is a viewing platform behind the mausoleum. Going to it you go along the trail which is literally on the edge of the cliff. On both sides of it, the chasm goes down hundreds of meters. But when you go out to the viewing platform, which is just above the precipice… it’s breathtaking! But there are some minuses. Every day here come crowds of tourists, who are photographed on the edge of the cliff and block the whole view. Therefore, before you go to the mount, better look at the schedule of excursions to the mausoleum. I come guarantee that if you come when there are no tourists, you can enjoy a beautiful view of the surrounding area. In conclusion, I want to say that holiday in Montenegro can be a great chance not only for spending time on the seacoast but also for outdoor activities. This article was written by our collaborator Alexandra. You can follow her on Twitter if you want. If you are interested here you can find some Montenegro phrases for to learn before your travel there.